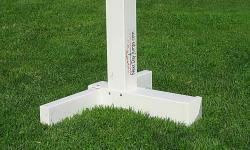 All standards can be ordered in three configurations depending on the type of jump cup to be used. 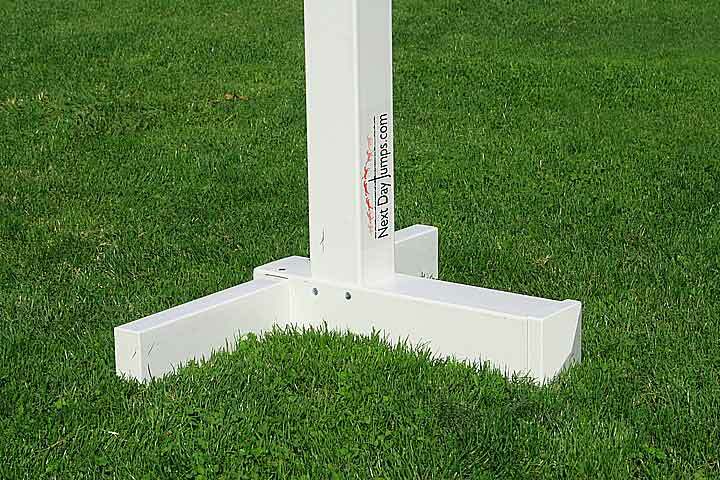 The post is routed with keyholes for use with keyhole jump cups. 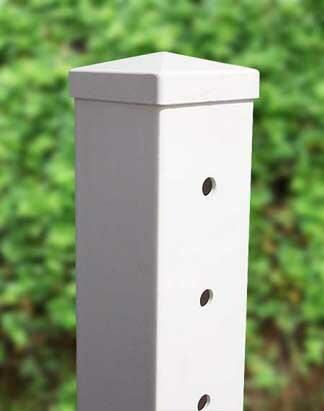 The post is drilled with 1/2" holes for use with pin type cups. The post has metal keyhole tracks. 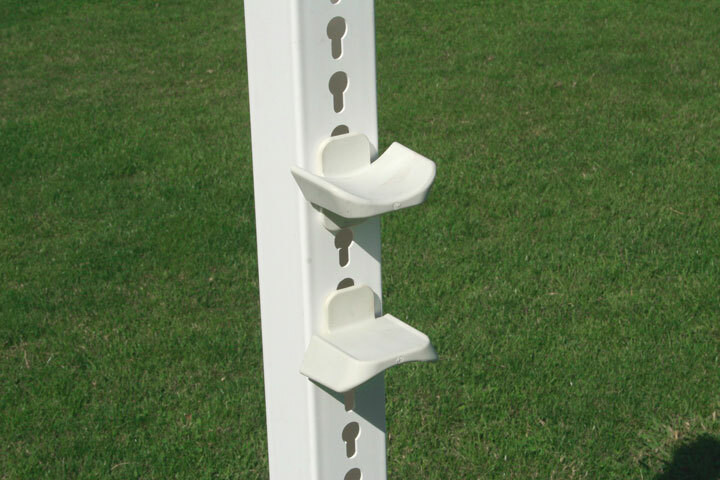 The keyhole routed directly into the post is good for lighter duty jumping uses, while the metal keyhole track is better suited for heavier use, such as professional training stables and horse show use. The routed keyhole has a 3 year warranty, while the metal keyhole track has a lifetime warranty. Choose your style from the drop down box under the standard of your choice. Base caps - Add base caps to provide a finished touch to your standards or to add weight to the jump. With the base caps you can add sand to the base to make the standards heavier. The standards are sturdy and will work just fine as they are but many like the feel of a heavier jump. Just fill the base with sand out of your arena and glue in the base caps. Beautiful, fresh, and indispensable. 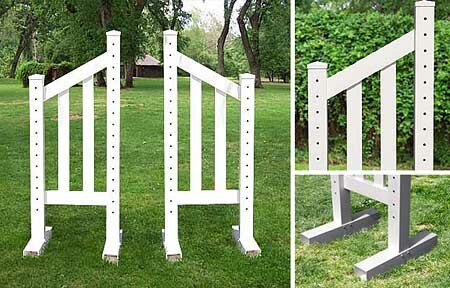 These horse jump standards are sized perfectly for any arena. 5' Tall, 24" wide and 24" deep. They are what you need. Sold in pairs, 2 standards to a pair. The inside of the standard is drilled for keyhole or pin cups, the outside post is undrilled. Keyhole Tracks and Keyhole Jump Cups sold separately. 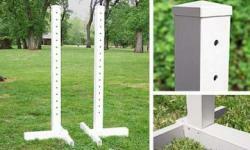 Made out of durable, strong, PVC, that does not need painting. 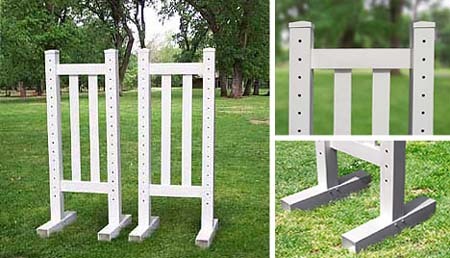 The angled top rail gives these standards a fresh look. 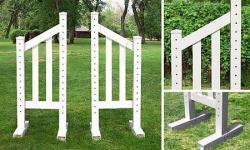 Order several pairs of wing standards for your arena and mix with other designs of standards to create a custom look. For Keyhole Jump Cups order Keyhole Tracks and Keyhole Jump Cups separately. 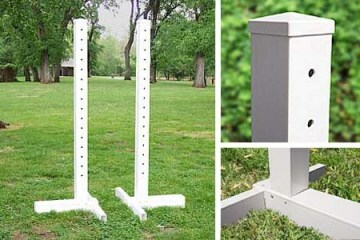 Made out of durable, strong, PVC, that does not need painting.